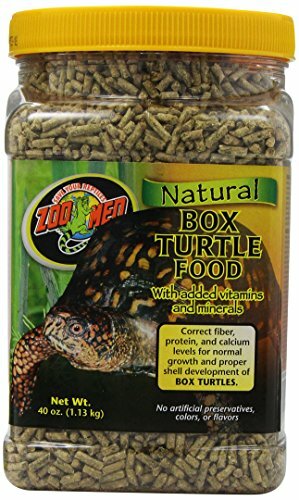 Zoo Meds new Natural Box Turtle Food with added vitamins and minerals contains the correct fiber, protein, and calcium levels for normal growth and proper shell development. This new food contains small amounts of papaya and mango as well as animal protein necessary to meet the unique dietary requirements of Box Turtles. It also contains a variety of nutritious plants that your Box Turtles will love. This new food contains no artificial colors, flavorings, or preservatives.